Put the layered sound of classic keyboards in your music. With four separate layers of samples, comprehensive effects and modulation and a built-in step sequencer to trigger your sounds, Layers is the instrument that will bring out your best ideas when you need them. Skip straight to the music with Layers’ built in patches from expert sound designers, or get creative and create your own sounds from Layers first-class sample sets. With an easy-to grasp interface it’s easier than ever to bring out your own rich, evolving synth sounds to suit your musical needs. Create animated, evolving patches with the trig sequencer. Each layer has its own trig pattern that can be played in sync with the tempo or stepped through for each new note played. Think of each of the four layers as a separate sample player, with separate multi mode filter, envelope, effect settings, pan and level. Think of each layer as a separate sample player with individual settings for each. Select one of Layers’ built in sample sets for this layer. Each layer has its own multi mode filter with LP24, LP18, LP12, BP and HP modes. Set which effects you want to apply to this layer. Pan, Envelope and volume for this layer. These settings are per layer and you select the layer you want to edit with the button in the edit section. Fine tune or create intervals. Create strums arpeggios or buildups with the individual trig delay setting for each layer. Set the envelope curve for the active layer’s filter. 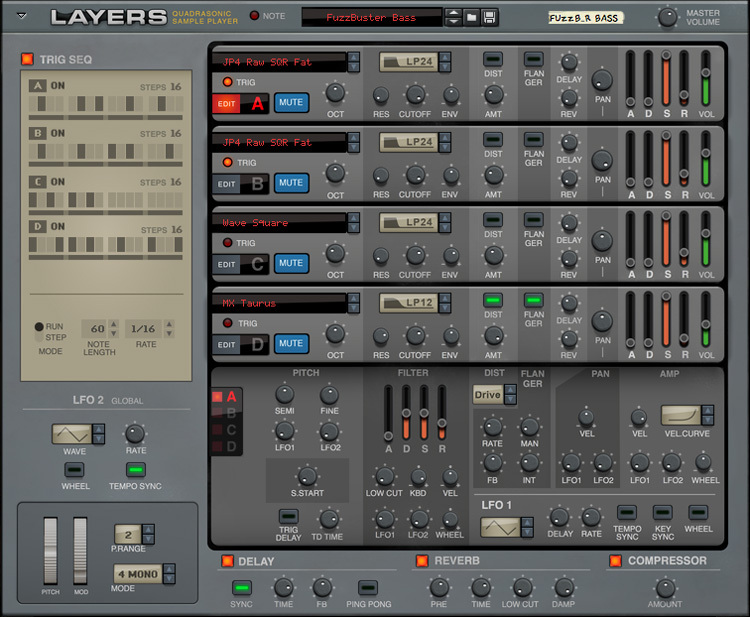 The insert effects (Distortion and Flanger) are separate for each layer. Set pan modulation from LFO or velocity. Set amp modulation from LFO, Control Wheel or velocity. The send effects are global and available for all Layers as send effects. Glue the sound together with the built-in compressor. The sample set also includes acoustic samples and raw waveform samples. * All product names used are trademarks of their respective owners, and in no way constitute an association or affiliation with Propellerhead Software. Any products or trademarks mentioned are solely used to identify the products whose sound was studied during development and/or for comparison purposes only.